The Reviews and feeds are the best way to build a trust factor among your customers regarding your shopping site. 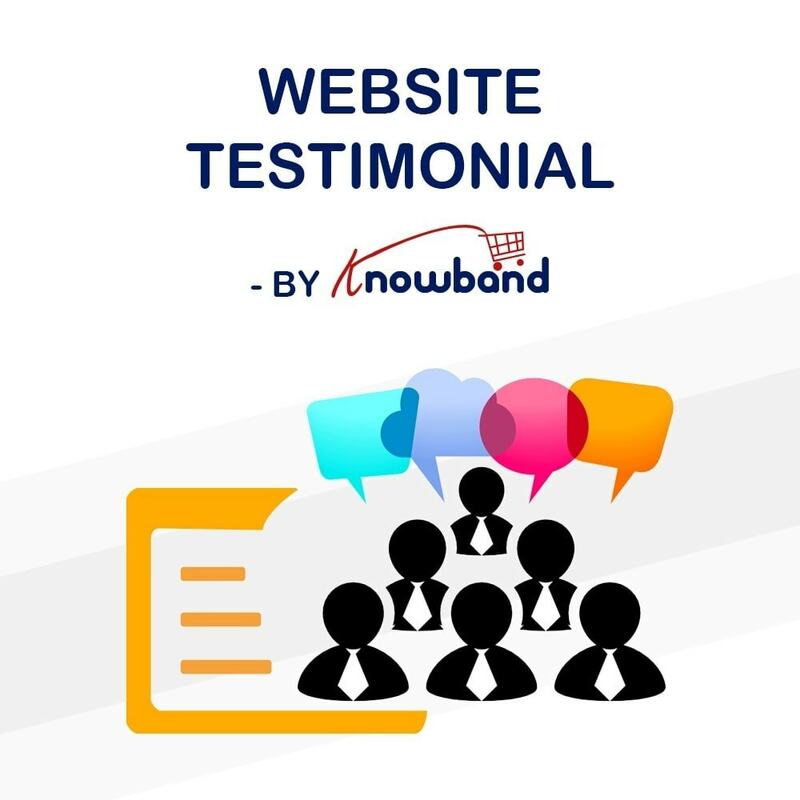 Customer testimonials are one such form of feedback that can deliver the positiveness about your site on multiple grounds. A positive customer testimonial cannot only build the trust factor, but also encourage the readers to draw similar experience by shopping on your site. This Prestashop review addon is all you need to manage the customer testimonials on your store and improve the conversion rates. The Prestashop addon provides all the essential controls and functionalities to receive and showcase the testimonials on your store. As an admin, you have the ultimate access to choose which testimonial to showcase and which one to hide with this Prestashop comment addon. Improve your site UX and trigger quick customer decisions to purchase. Improve your site's confidence and trust in the customers. Eliminate buyer's dilemma by showing positive testimonial from past customers. Add human factor from real feedback by actual users. Act as a complement element in your product descriptions. The admin has the option to approve or reject the testimonials with the Prestashop comment addon. The admin can show/hide any testimonial at any time using the Prestashop rating addon. 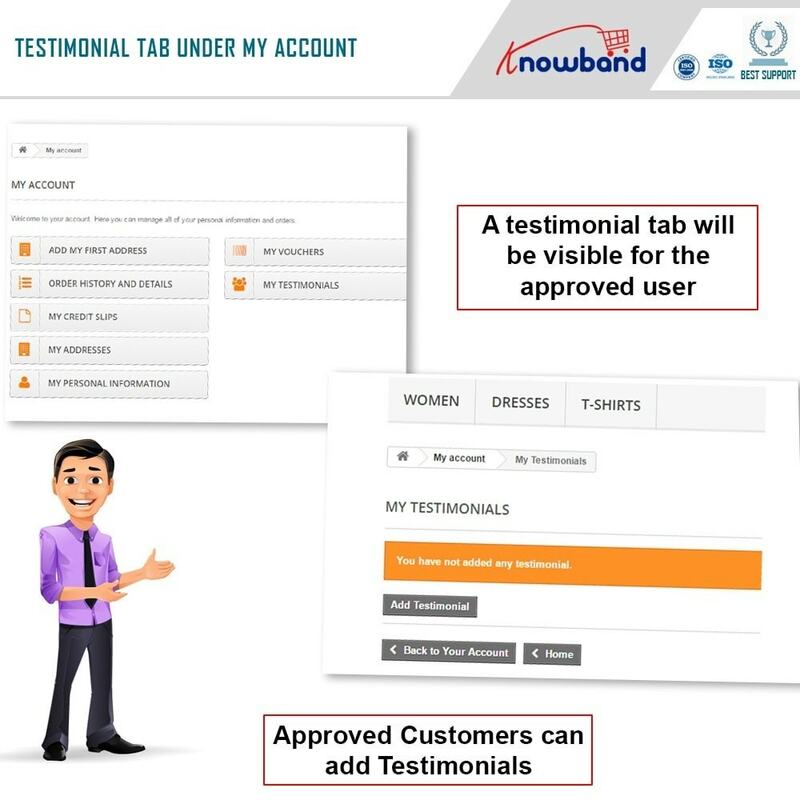 He/she can show testimonials on the homepage or the left column or the right column. The admin can schedule old testimonials to get deleted automatically. 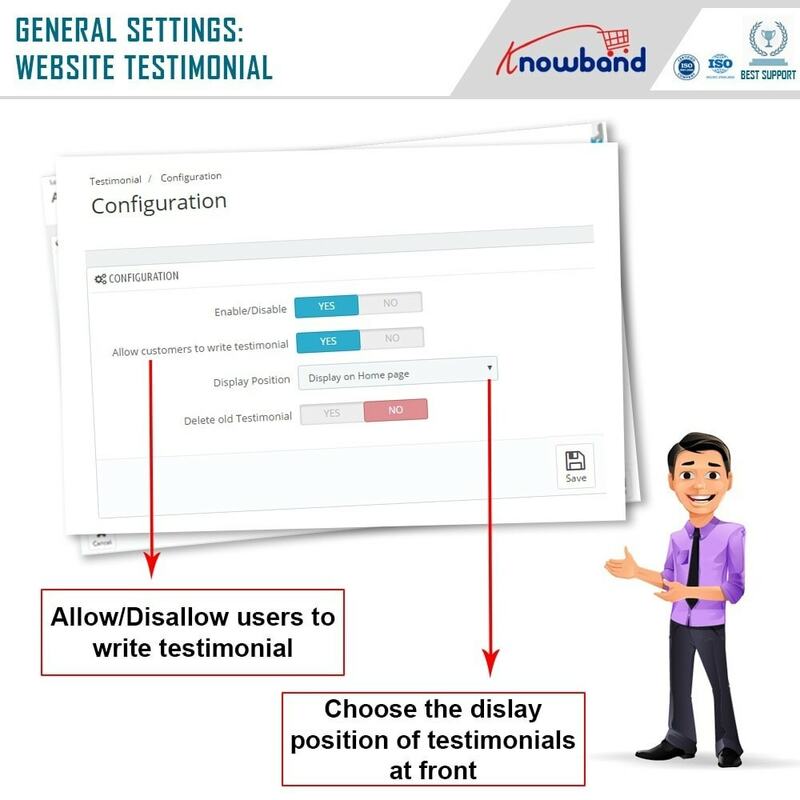 The admin can show/hide the option to write the testimonial on the website with the Prestashop Website Testimonial by Knowband. The Prestashop store admin can manage customer’s permission to write the testimonial on the website. 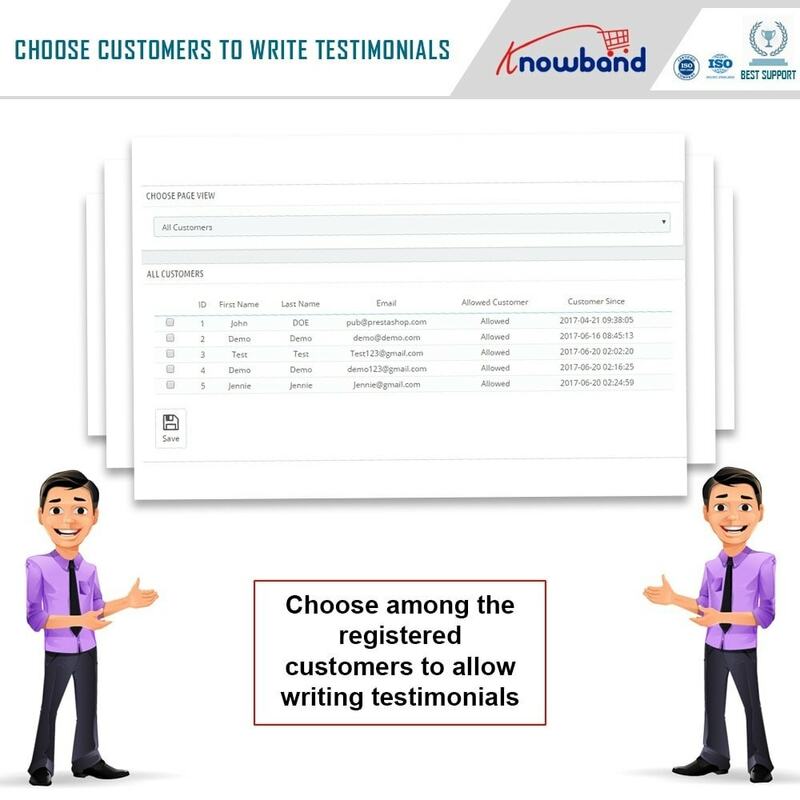 He/she can block any particular customer from writing the testimonials on the website. The Prestashop Website Testimonial addon adds a block to the front for writing testimonials. The Prestashop addon by Knowband provides an option to show/hide the block. The Prestashop review addon adds the blocks to show the other customers' testimonials. The admin has the option to show testimonial on the homepage, left column, or right column. 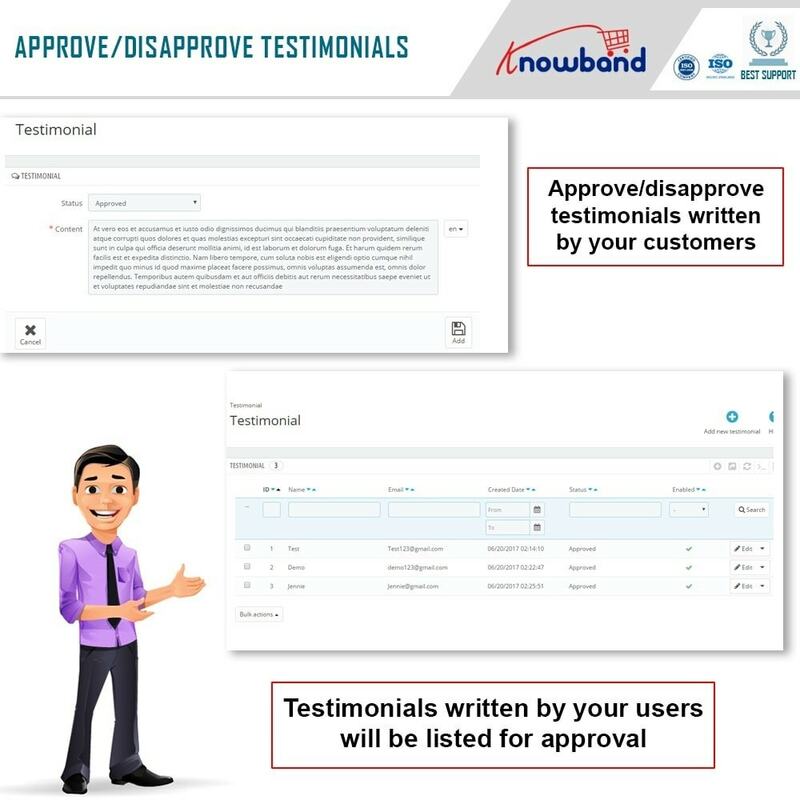 Testimonials don't go live until approved by the admin. The PrestaShop comment provides an option for the admin to approve/disapprove a testimonial. The admin can schedule old testimonials to get deleted automatically after a time. 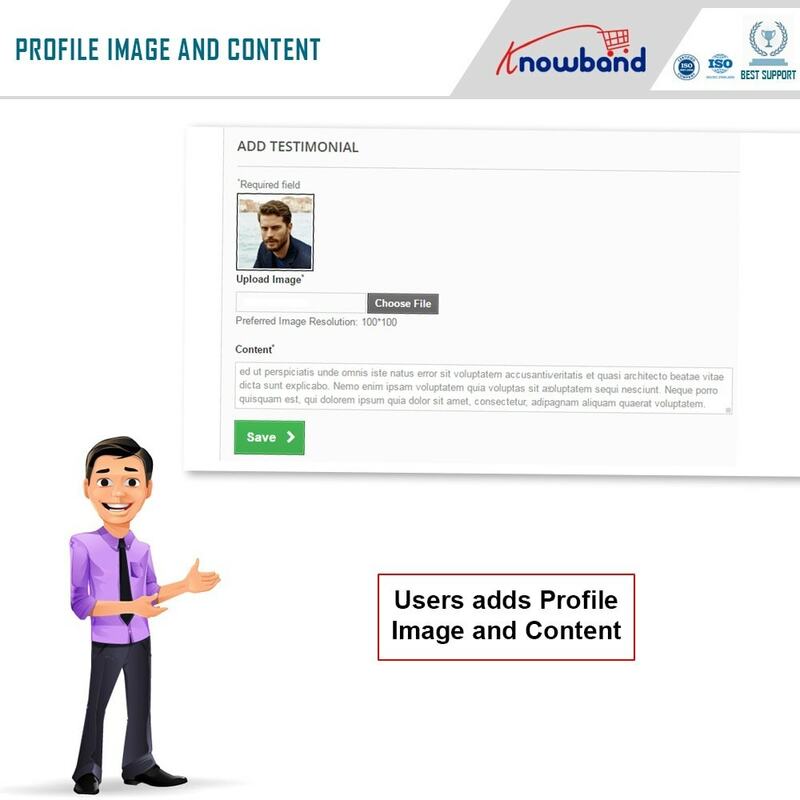 There is an option for customers to upload images with the testimonials which build trustworthiness. 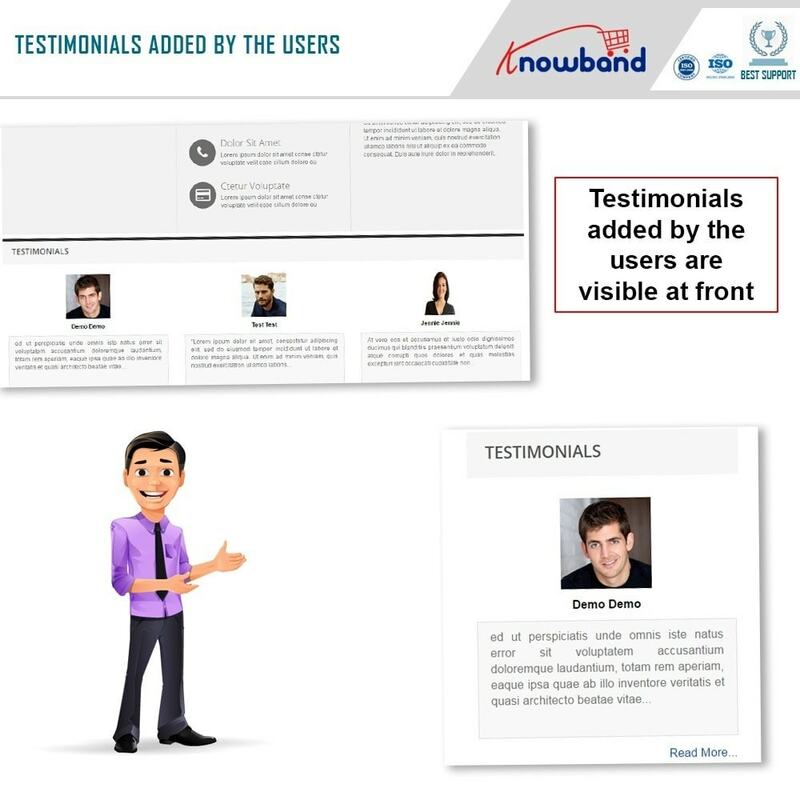 With a responsive interface, the testimonial can be viewed even on the smartphones. The Prestashop rating addon is easy to install and configure; no technical skill required. The Prestashop module has three layouts - homepage, left column and right column. The Prestashop comment addon displays random testimonials from an approved list. The addon by Knowband is SSL compatible. Prestashop rating addon is Multi Store compatible. Prestashop Website Testimonial is Multi-language compatible. Responsive interface, they can write testimonial even with mobile phones or tablet. Upload image feature while writing a testimonial on the website. Interface to share their shopping experience with other. While reading other testimonials they get to know more about the website. Customers get mail notification after admin gives them permission to write a testimonial. Customers get mail notification after admin approved their written testimonial.